Simple Secrets to Train a Dog not to Jump – ComeHereBoy! When a puppy jumps on you, it’s so hard to get mad at them. It seems so harmless when they’re small. But then that puppy grows and in a few short months you have a full grown dog jumping on people in excitement whenever anyone comes in the door. Jumping is not so cute when your pregnant sister is bowled over by your German Shepherd, or when your Jack Russell scratches your nephews face. Luckily there are a few simple solutions to train a dog not to jump. It seems counter intuitive, but similar to teaching a dog to bark on cue, training a dog to jump on cue puts you in charge of the behavior. Cued behaviors become less frequent as a rule because the dog is looking to be told to do something first, but it also teaches your dog a name for the opposite behavior, so have control of that too. So lure your dog to jump on you, give it a name (don’t reward it, jumping is usually a reward enough to a jumper.) Then lure her, with a treat, to jump off of you, give it a name and reward it. Keep practicing until she can do both behaviors with a word cue. This is also great because your dog can be called off in case she jumps on visitors. You may want to practice coming in the door and preemptively giving her the “off” command, then a sit command and reward that instead. Make sure that you praise your dog with petting and treats at her level. There’s a good reason for that. That is because one of the reasons dogs jump is because in dog world, they greet each other face to face. Your dog jumps because she is trying to greet you. Yeah, let’s not punish the dog for trying to say ‘hi’. Let’s teach her that she can wait to say ‘hi’ until you get down to her level. When I was first learning dog training, it was advised that you knee a jumping dog in the chest. If there’s one thing I’ve learned since then, it’s that dogs become fearful and/or aggressive towards situations that cause them pain (Don’t ask how I know this). You may end up with a much worse problem if you start kneeing her in the chest when people come in the door. Instead, give your dog the cold shoulder. Tell her with your body language: I don’t pay attention to you when you jump! Fold your arms, look up at the ceiling, don’t say anything and walk into your dog until she jumps down. When she sits, then praise and pay attention to her – dropping down to get on her level. 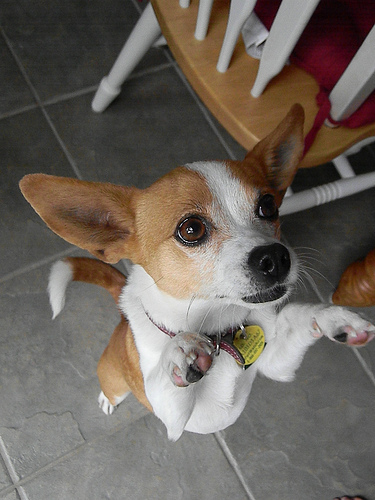 If you do this consistently, your dog will learn to sit and wait for you to greet her instead of jumping on you. Bonus points if your dog sits like this when people come in the door. So anyway, the dog hears the door open and she knows that means she will jump on people and get touched and talked to (even if it’s negative, the touching and talking actually reinforce the behavior). So we replace the current behavior with a new one. So, of course, teach your dog a sit, a wait, and a release word before you try to teach this behavior. Now, the replacement begins. You put your dog on a leash with a collar on that they can’t slip out of. Either you hold it while you have a friend help or you tie the leash to a door or something else unmovable. Then, you (or your friend) go outside. No treats needed because if your dog is jumping on people, they like attention enough for it to be the reward. You come in the door. Your dog, predictably, will lunge and try to come greet you. 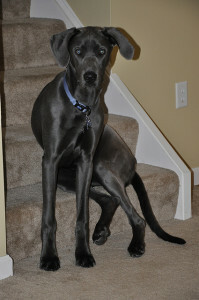 You say the cue for sit and stand in the same spot until your dog settles down and sits. You cue wait. Well, you can start walking toward them, but I can almost guarantee that your dog will get up and start flipping around again. Stop immediately. Repeat cuing the sit and wait and start walking toward them until the can sit and wait long enough for you to get to them. If you get close enough that they can jump on you and they get overexcited and forget what they just learned… back up quickly before they can jump on you and start again. The dog only gets touched if she is sitting and waiting nicely for you. Then make sure you drop to her level to greet her (try to keep it a low key greeting to keep her from getting overexcited again). After you’ve worked this every day for ten minutes over a week and hopefully had a few friends come practice with you, she should have it down to where she can be off leash when you do it and you’ll have a dog that sits and waits patiently for people to come pet her. Well, there you go! Some simple solutions for training your dog to stop jumping all over everyone when they come in the door. So tell me in the comments, what was the worst experience you’ve had with your dog jumping on someone?